90-ball bingo is very popular amongst bingo players in the UK. Most online bingo halls offer this version of bingo in addition to 75 ball bingo. While the concept of the two games are the same- you buy your cards, the announcer calls out a random number which you mark on your card if it appears there, and the first to fill a specific pattern is the winner- the games are very different. 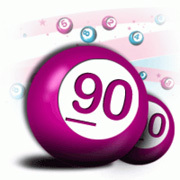 As you may have guessed by the name, 90-ball bingo has 90 numbers that are chosen at random during the course of a game. This usually means that each game will last a little longer than the average game of 75-ball bingo. The main difference is in the way the cards (or tickets as they’re referred to in this variation of the game) are set up as well as the patterns each player hopes to complete. Each ticket consists of three rows of nine squares. Within each row, five numbers are printed in random spots. Players purchase their tickets prior to the start of each game. The announcer then randomly selects one ball at a time, calls out the number printed on the ball, and sets it to the side to be reviewed when a claim is made. For those who don’t know, a claim is the same as “bingo” in 75-ball bingo. One thing fans of 90-ball bingo prefer over 75-ball bingo is that there is more than one chance to win every game. The target pattern is specified before the start of the game. You are either looking for a single line or double line completion. When a player fills either a single or a double line, (depending on the game) they make their claim and collect their winnings. However, the game does not stop here. Play continues until a player achieves a “full house.” A full house is when every number on your card has been called. Once a player has achieved a full house, again, they must make their claim to collect their winnings. The number of tickets sold determines the winnings, which are usually less than the winnings collected by winners of 75-ball bingo... unless of course you manage to win both pots. However, the chances of winning at least one pot are better.